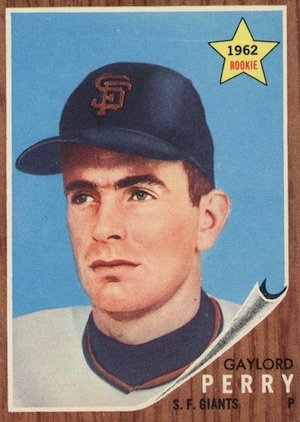 While not the most attractive release from Topps, the wood-grain design of 1962 Topps Baseball is instantly recognizable. 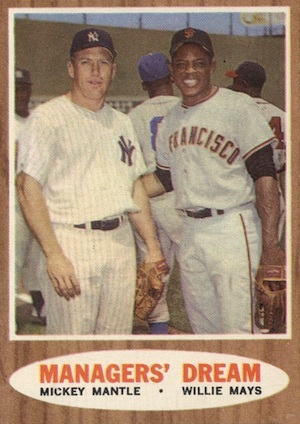 Lou Brock and Gaylord Perry are the key rookie card options and are joined by a plethora of Hall of Fame subjects. Continuing the trend of an ever-growing base set, 1962 Topps Baseball once again outdid the set size of all previous Topps releases with 598 cards. This sizable checklist, combined with a host of additional base card variations, makes it a challenging set for collectors to complete. 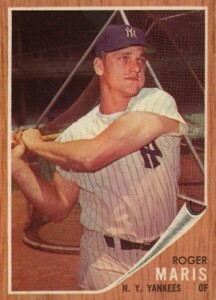 Shop for 1962 Topps Baseball cards on eBay. 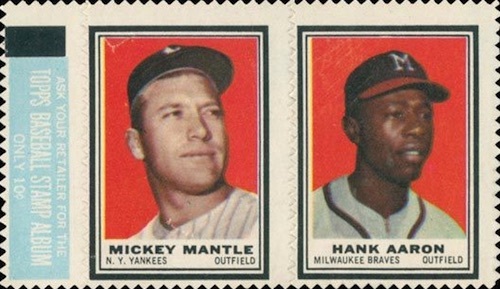 1962 Topps Baseball cards measure the standard 2-1/2" by 3-1/2", with most featuring a vertical layout. Although it gives the set more of a one-note feel, the wood grain is easy to spot. The subset cards feature different designs, but many still incorporate the faux-wood borders. Reminiscent of a matted photo, the 1962 Topps Baseball base design adds the appearance of a curling corner to reveal player info. Relying heavily on a large posed photograph, the cards are fairly simple. 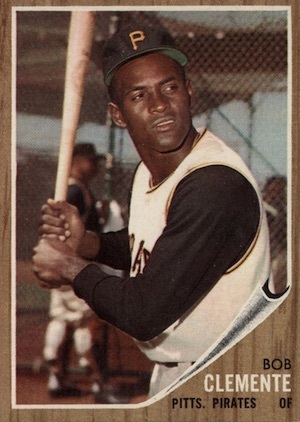 Additionally, many of the key rookie cards are noted as such inside of a yellow star in the top corner. Once again, teams logos are not found. Card backs opt for a Halloween color scheme with orange and black text and shading. 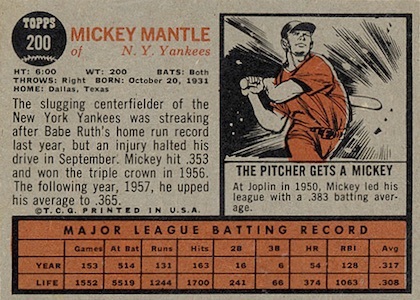 The card number is found inside a black baseball image across from a large cartoon that occupies a huge portion of the card. Year and life stats are noted at the bottom. 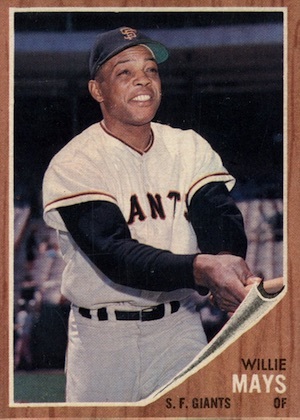 1962 Topps Baseball was printed and distributed in seven different series, making it even more difficult for collectors to obtain the full set at the time. While the high-number cards are treated to the customary scarcity, Series 2 is also notable as the site of a variation explosion. Each card in the series is found with a more limited green/yellow tint in addition to the regular version. The full series breakdown is shown below. Likely in an effort to entice collectors to pursue each release, every series in 1962 Topps Baseball features a major subset. League Leaders (#51-60) honors the top performers from the previous year. Babe Ruth Special cards (#135-144) offer a brief retrospective of the great George Herman Ruth. World Series Highlights (#232-237) document each game of the title series between the New York Yankees and Cincinnati Reds. Combining multiple images to convey a specific play, In Action (#311-319) cards also feature a unique headline. Not as rare as previous editions, The Sporting News All-Stars (#390-399 NL, #466-475 AL) subset features the top names in each league from the 1961 season. Lastly, as part of the high-number series, Rookie Parade takes on the role of toughest subset to locate. Each card is broken down into either five six separate boxes and includes four or five floating heads for players of the same position. 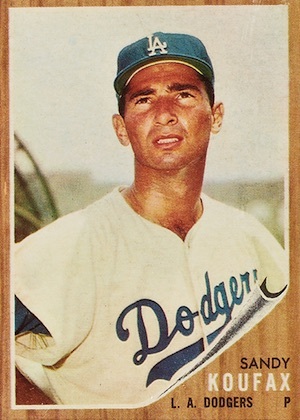 Errors and variations are quite common in 1962 Topps Baseball. In addition to the green-tint variations of Series 2, there are number of nuances to the set. While many of the variations are simply correcting previous errors, some showcase different images. Several checklist cards offer a variety of subtle difference and eight card numbers feature different player images. 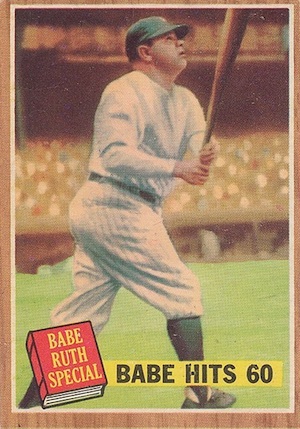 Card #139 actually has four versions, with two different images for Hal Reniff and two versions of the Babe Ruth Special ("Babe Hits 60") subset card. 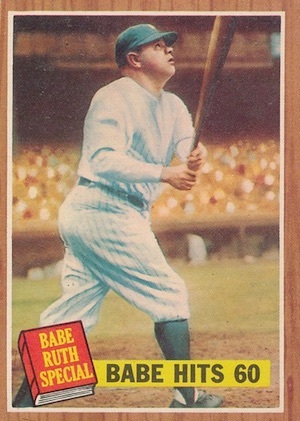 Although most distinguish the cards based on the hazy foul pole visible on the left, the more obvious difference is that one card features Ruth standing on dirt, while the other only has grass. 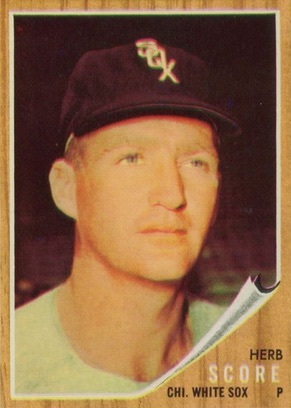 Reniff is also found with his intended number (#159) on the portrait card. Finally, cards #458 and #462 are found with or without hat logos. Those cards push the huge base set to 690+ cards for the master set. This is why many collectors consider 1962 Topps Baseball to be one of the most difficult sets to complete. 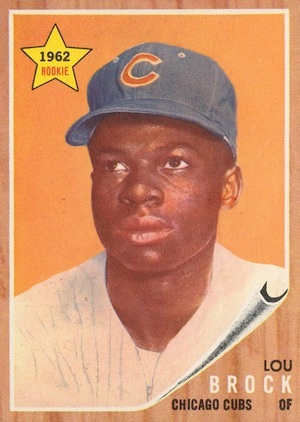 Like all vintage Topps releases, 1962 Topps Baseball is anchored by Hall of Fame subjects and key rookie cards. 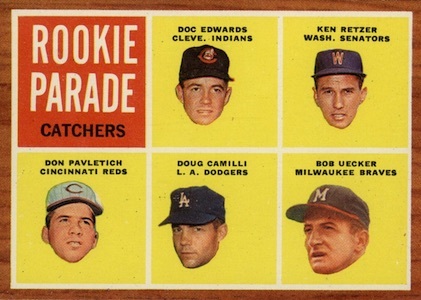 In addition to Gaylord Perry and Lou Brock, collectors can find rookies for John "Boog" Powell, Joe Torre and Bob Uecker. 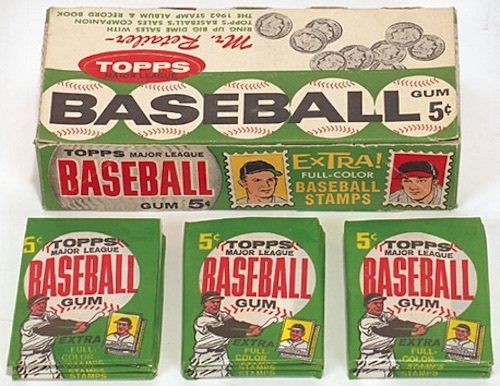 1962 Topps Baseball was originally available in one-cent wax packs, five-cent wax packs and cello packs. In addition to the base set, collectors could also find Stamp panels in wax packs. Coming two per panel, there are 201 total stamps, including 181 individual players and 20 team logo stamps. The stamps are found with either a red or yellow background and Roy Sievers is available with the Phillies or A's. At the time, collectors could mail away for a special album to house the entire stamp collection. The cost for this added benefit was just a dime. 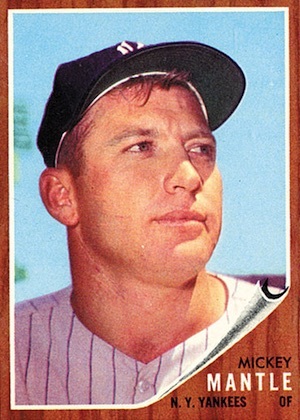 Cards from the 1962 Topps Baseball set are particularly hard to find in higher-grade condition due to their propensity for chipping around the edges. In addition to the traditional release, Topps also issued a version for the Venezuelan market as they had previously done. The partial parallel set covers the first 198 cards. Short prints (SP) are noted below. IA = In Action, AS = All-Star, RP = Rookie Parade. 201 cards. The stamps are grouped by team/league and listed in alphabetical order by last name starting with the team logo. Stamps are found with either red or yellow backgrounds. 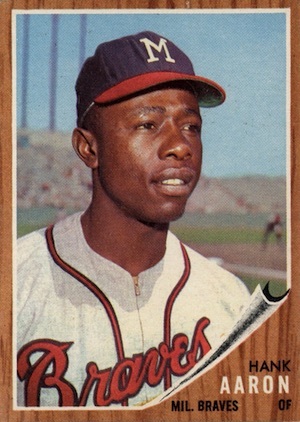 1962 Topps 129 Lee Walls ( Facing Left, Green Tint ). PSA 6 EXMT. (TX09281WXM). 1962 TOPPS # 146 DON DEMETER PSA 8 !! Nice! 1962 Topps 313 "Maris Blasts 61st". PSA 4 VGEX. Always in demand. (TX7729DXM). Like the 1961 set, the 1962 Topps set is a very difficult set to complete, with cards from the last series (#523-598) very tough to find. Fortunately, I completed the 1962 set sometime in the late 1980’s, and it was a very challenging set to complete even then, at a time when old baseball cards were a lot cheaper back then.